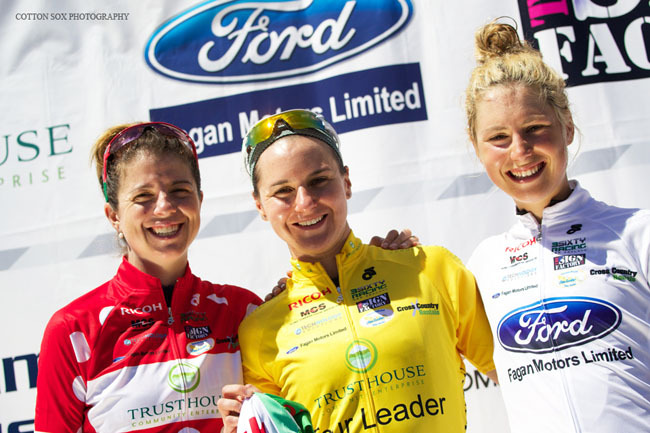 With the US National team holding the Top 5 on GC the Australian riders decided to get aggressive on Stage 3 of the Trust House women’s tour of New Zealand. They threw plenty at Team USA and were rewarded with stage success. "We gave it everything," stage winner Katrin Garfoot from the Australian national team said and she is in third place only 18 seconds behind new tour leader Evelyn Stevens – USA team. The race started slow with riders conserving energy for what laid ahead, ten laps of a 12km circuit with a tough hill climb each time around in hot conditions. The action started with three laps to go, after a small group of thee riders, containing Tayler Wiles from team USA, Ellen Skerritt from Hi 5 Dream Team and Joe Hogan from Tibco attacked at the top of the hill managing to get away and create a lead of 55 seconds over the main bunch. This didn’t last long as the US and Australia national teams force the pace next time up the hill and once again the bunch was all together with two laps to go. On the penultimate time up the hill, nine riders manage to break away containing some of the strongest riders in the tour such a Stevens and Megan Guarnier from USA, Lauren Stevens from Tibco SVB, Katrin Garfoot and Rachel Neyland from Australia national team, Tessa Fabry form Hi 5 Dream Team, Lucy Coldwell and Miranda Griffiths from Holden Racing Team and Ruth Corsett from team Fagan Motors. They quickly gain a lead of 30 second that with 10 km to go grow up top over three minutes, from here was to come the stage winner of day three And a new tour leader. The ride of the day was from DNA-K4 Gabrielle Pilote-Fortin from Canada After the breakaway of nine riders went off, Gaby attempted to bridge the 2 minute gap alone. She didn't quite make it across, but the heroic solo effort earned her the Fagan Motors Young Rider's White Jersey. 8 Rachel Neylan (Aus) Australian National Team all s.t. 44 Tayler Wiles (USA) US National Team all s.t. OTL Elizabeth Steel (NZl) Trust House New Zealand National Team all s.t. OTL Nina Wollaston (NZl) Trust House New Zealand National Team both s.t. 16 Rebecca Mackey (Aus) Australian National Team both s.t. 20 Sharlotte Lucas (NZl) Holden Racing Team s.t. 23 Hannah Van Kampen (NZl) Ramblers Club both s.t. 26 Ellen Skerritt (Aus) HI 5 Dream Team both s.t. 29 Denise Ramsden (Can) Pepper Palace Pro Cycling both s.t. 33 Anne Perry (USA) DNA Cycling p/b K4 both s.t. 39 Samara Sheppard (NZl) The Sign Factory both s.t. 3 Rebecca Mackey (Aus) Australian National Team s.t. 8 Ellen Skerritt (Aus) HI 5 Dream Team both s.t.